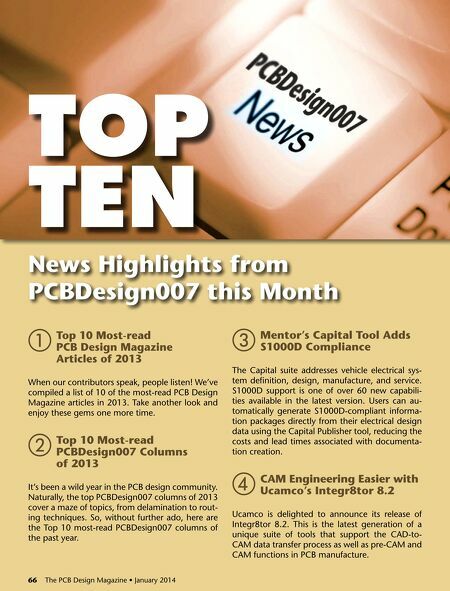 Top Ten News Highlights from PCBDesign007 this Month aTop 10 Most-read PCB Design Magazine Articles of 2013 When our contributors speak, people listen! 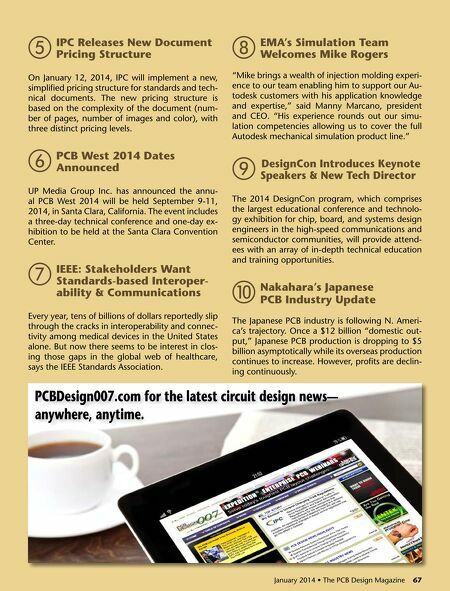 We've compiled a list of 10 of the most-read PCB Design Magazine articles in 2013. Take another look and enjoy these gems one more time. bTop 10 Most-read PCBDesign007 Columns of 2013 It's been a wild year in the PCB design community. Naturally, the top PCBDesign007 columns of 2013 cover a maze of topics, from delamination to routing techniques. So, without further ado, here are the Top 10 most-read PCBDesign007 columns of the past year. 66 The PCB Design Magazine • January 2014 Capital Tool cMentor'sCompliance Adds S1000D The Capital suite addresses vehicle electrical system definition, design, manufacture, and service. S1000D support is one of over 60 new capabilities available in the latest version. Users can automatically generate S1000D-compliant information packages directly from their electrical design data using the Capital Publisher tool, reducing the costs and lead times associated with documentation creation. dCAM Engineering Easier with Ucamco's Integr8tor 8.2 Ucamco is delighted to announce its release of Integr8tor 8.2. This is the latest generation of a unique suite of tools that support the CAD-toCAM data transfer process as well as pre-CAM and CAM functions in PCB manufacture.